If you're a typical American, you plan to indulge on turkey day. But did you know that you're likely to eat between 2,500 and 4,500 calories on Thanksgiving Day? If you're on a diet, those calories may ruin a week's worth of healthy eating. Even if you're not trying to lose weight, Thanksgiving calories can add inches to your waistline. So how do you eat less? There are seven smart ways to eat less on Thanksgiving (or any special occasion) and still enjoy the holiday. If you want to enjoy Thanksgiving and keep your diet in check, it might be smart to eat diet-friendly dinners in the week before the big meal. That way you'll sit down to the big meal feeling good about your body. Then create a plan to serve several low-calorie dishes at your holiday dinner. But don't worry, not every Thanksgiving food has to be low fat or in calories. Simply choose the foods that you're likely to overeat and reduce the calories in those dishes. 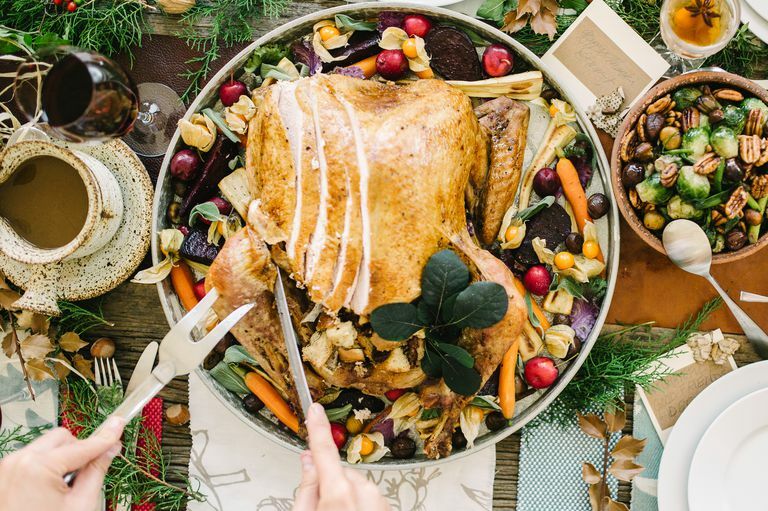 Use these guides to find calorie counts, nutritional data, smart swaps, and diet-friendly recipes for typical Thanksgiving day foods. Even if you reduce calories in your favorite dishes, it's still possible to eat too much. Let's face it, we all love to overfill our plates and eat for hours on this special day. But if you use these smart tips you can eat less on Thanksgiving and keep your diet on track. Snack smart. Pre-dinner snacking can make or break your total caloric intake for the day. But you don't want to starve yourself before the big meal either. If you're too hungry at dinner time, you're more likely to overeat. Before you sit down to dinner, munch on healthy snacks that are good for weight loss like veggies or fresh fruit. Try to avoid the salty, crunchy fried snacks that are loaded with fat and calories. Save your calories for the big event. Make careful choices about booze. Calories from alcohol can really add up. In addition, you're less likely to make healthy food choices when you are tipsy. Before you get together with friends and family, decide if you will drink any alcoholic beverages and set a limit for how many you'll consume. You may decide that Thanksgiving is a good opportunity to avoid booze to keep your diet on track. Fill your plate once. When it's time to sit down at dinner, evaluate the offerings and make careful selections. Try not to grab foods out of habit or obligation. You're not required to eat rolls, stuffing, or other traditional favorites simply because they are on the table. Pick the foods that you truly enjoy. Then, fill your plate once and don't let the foods touch. Separating your food is a sneaky way to avoid heaping your food too high. Become a gabber. Start a conversation at the dinner table. When you talk more you slow down the eating process. The slower you eat, the more you're able to feel the sensation of fullness that will help you curb overeating. So, gab away and stay chatty until the meal is complete. Save dessert for later. Give your meal a chance to settle and digest before you dive into pie or dessert. It may take thirty minutes or more to feel the sensation of fullness from your meal. So if you indulge in dessert too soon, you may eat more and feel overly stuffed later on. Give it a few hours, then re-evaluate your need for dessert. You may find that you are too full for sweets and choose to take it home for another day. Before, during, and after the holiday, you can burn Thanksgiving day calories with fun family activities. Some families sign up for a turkey trot, which is a great idea. But keep in mind that calories you burn during a 5K run will probably be far less than the calories you eat at dinner time. So how do you put a dent in the remaining excess calories? Before the holiday, schedule a few extra workouts in your weekly routine. You can even ask family members to join you! High-intensity intervals are the most effective workouts if you want to burn more fat and calories. Schedule one or two extra workout sessions for the next couple of weeks to banish your Thanksgiving burden.